have struggled a little with the time change. I was really happy to have my new house quilt with me on the plane as I had a few delays as well as long lay overs. That’s what happens when you try and save a few dollars on a more reasonable flight price. I am always amazed at how many people have idle hands, this is always one of my best times to stitch, no interruptions and it sure makes the time pass quickly. 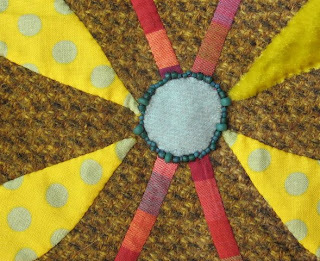 Here is a sneak preview of my new quilt along with more beads I just can not resist. As you can see I just love the combination of hand dyed wool and fun cottons along with many yarn and bead embellishments. It is hard to know when to stop. The only reason I am hustling is that I may be teaching this quilt early next year and will be needing to have it photographed shortly. It will also be an upcoming book in the spring. Along with this quilt I am working on my 2008 BOM. 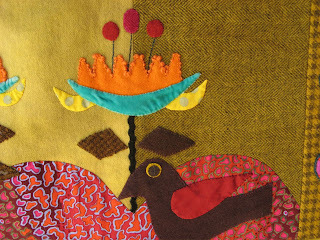 I am very excited with its progress along with all 13 birds that will appear on the quilt. Here is one with a little attitude. Today I have just been writing my newsletter for September and here is a new kit ‘Red Clover’ that will be available as soon as the updates are made. 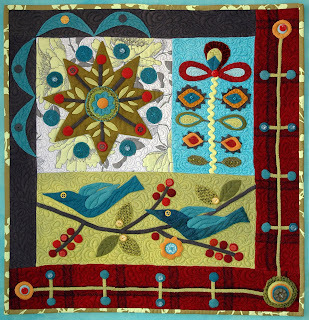 This quilt was featured in the Australian Homespun Magazine earlier this year. 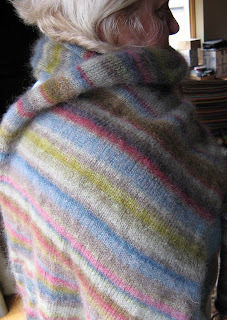 I had fun using hand dyed wool, raw silk, velvet and cottons and embellishing with fibers, beads and buttons. I have been on the computer all day and have grumpy teenagers to feed so I am going to call it quits for the night. Hope you all get some stitching time it sure makes me a happier person. 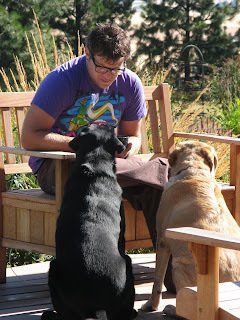 Jason is beginning to settle in and our dogs have been quick to figure out that having him here is a very good thing. Sue is on the road again today heading home and we all miss her already. It has been a busy time together, a lot of things have been accomplished and as usual there is never quite enough time to do it all. We played, traveled, learnt, created and worked together. 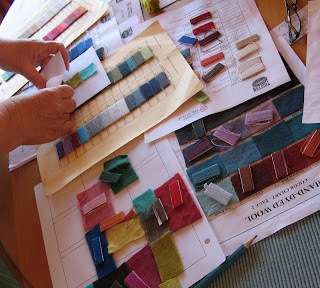 We looked at more colors to add to Sues line of wool threads with Tristan. Watch for a color chart of the current colors to be posted on her website soon. They are wonderful to use and luscious to look at. 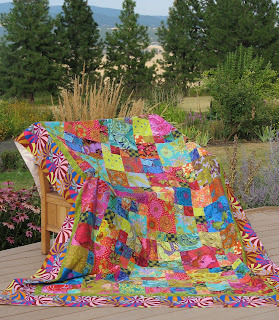 A few projects have been left to be completed at a later date but we have managed to finish one of two quilts from our workshops with Kaffe Fassett and Brandon Mably. Mom is wrapped up in Sue’s version. Boiki, mom and dad’s adopted dog has adapted quite well to his new life of luxury. 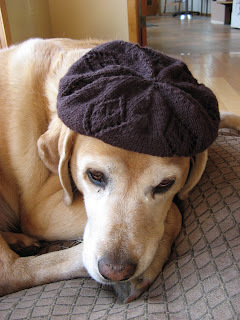 Our Vietnam trip is further along and in between all the other projects Sue managed to finish this, a beautiful knitted beret from the latest Rowan magazine. I swear she has ten hands. I collaborate with my sister Wendy on many aspects of my business so I am very excited that she is going to blog alongside me. We have endless creative ideas and this will be a great way to let you see what we are up to behind the scenes. Today we have been working on some photographs for my books to be released at spring market. We will be posting some teasers soon. We were planning on taking a walk through the woods to photograph but the clouds stormed over and kept us inside. There was even a chill in the air and we wished we had finished our latest knitting projects, lovely colorful wraps to keep away the cold. 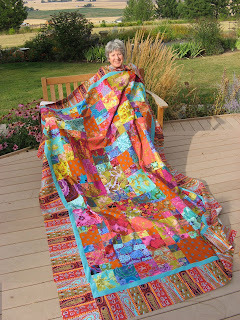 I am feverishly working on my Brandon Mably wrap (right) while Wendy is busy trying to finish her Kaffe Fassett wrap. 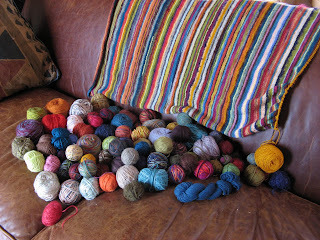 We have collected lots of yarn for the Brandon Mably wrap and Wendy has dyed quite a few skeins as well. It has been interesting to play with color, using hand dyed and variegated yarns and playing around with light and dark contrasts. 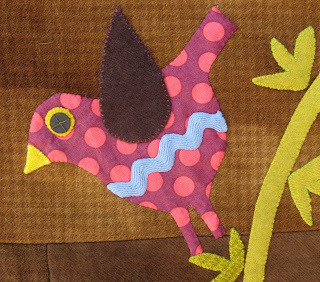 I go through a similar process when I choose colors for applique often finding that the fabrics I use for images need to be highlighted. I accomplish this in many ways, shadowing with darker colors, couching contrasting fibers and even beading edges of applique. 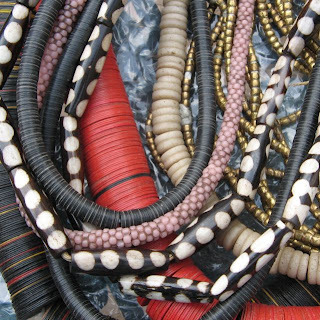 We are very fortunate to have so many wonderful materials available for embellishment enabling us to make our projects unique. Here is a glimpse of what I am bringing home. Who can resist these! 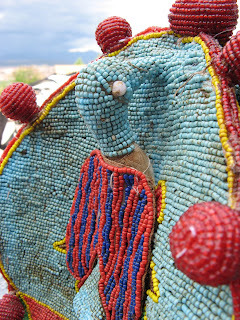 I also could not help myself when I saw this and of course it had a bird on it. I am having a wonderful break with my family in Spokane, WA. 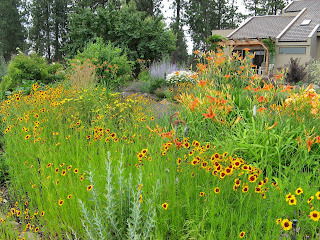 The weather has been warm and I have been able to spend time in Wendy’s lush flower gardens. Life has been a little slower so I have had time to think about new projects for next year as well as finishing up some handwork on up coming pieces. We spent the weekend in Canada driving the Selkirk Loop. What an amazing area! I was able to find a few wonderful pieces of hand made pottery to add to my collection as well as a lovely green handwoven shawl. 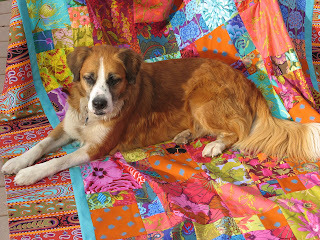 Wendy and I will be spending the rest of the week finishing up our quilts from our Kaffe Fassett class as well as planning our trip to Vietnam. We leave in three weeks to teach for a non profit organization in Ho Chi Minh City. My son Jason is relocating to Spokane and arrived today. I am very excited for him and wish him well with his new venture, I will miss him greatly.